Organize your kitchen and provide quick access to essential dry ingredients with this Baker's Mark 6.3 gallon shelf ingredient bin. Depending upon your kitchen layout, this bin can be stacked on your countertop, under a prep table, or positioned on shelving. A ribbed top and bottom ensure a secure fit for other stacked Baker's Mark 6.3 gallon bins. Additionally, a front and back handle are available to easily move or reposition bins. Have you ever asked yourself, "Can this bin hold 25 pounds of high quality dog food?" Well, the answer is, yes, yes it can. While a bit of an unconventional use, it became necessary. We had one tall, large bin that held three 75 pounds of dog food, but it was bulky, cumbersome, and took up too much space. I'm also short, so getting the food out of the bottom was difficult if my taller counterpart wasn't around to help me. The standard mass market dog food storage options weren't big enough or wouldn't fit in the available space. One of the dogs had already broken two of those. Those crafty buggers. Enter the Baker's Mark 6.3 Gallon ingredient bin. It has been the perfect solution. It is out of the dogs reach (they're large & giants), and holds at least one 25 pound bag of food. I am definitely going to order more at a later date for my flour and sugar. The dog food solution was the immediate need at this time. These bins have been great for keeping our flour and salt easily accessible and free of contaminants. The 6.3 gallon bin easily holds a 20 lb bag of salt or a 25 lb bag of flour. 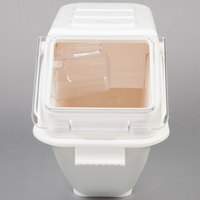 The flap stays open when in use and scoop conveniently clips on to the interior of the bin. First we bought the 2.6 Gallon to see how they would hold up, it not only past the lest, it was better and stronger than we had hoped, ended up with 4 of these, they fit tight and are durable,. Having a startup cafe, we needed all equipment for our cafe and this one is just right. This worked as expected and it's just the perfect size to store our 25# dry ingredients in. Love these storage bins. I wanted to tidy up my bakery and make it less cluttered. I purchased several of these in different sizes and the staff loves them. Perfect for our flour and sugar. Keeps them fresh and easy to access. Holds a 50 lb bag of sugar and has a clip for your scoop. Fits great under one of our work tables. Very durable. I have three of these underneath my work table. They will hold 50lb of granulated sugar or 25lb of all purpose flour at a time. We purchased two of these 6.3 gallon ingredient bins. They work perfect for 25lb flour and sugar. The added measuring cup is super handy We will be purchasing more of these in the near future! I have been using these for 3 years now, and they still work great! Everything is sturdy, lasts a long time, and holds a lot. They are NOT air-tight, but if that is not a big deal, then these will work great for you. We love this item. It is perfect for storage on the shelves below tables we have one for our salt and sugar. It also seals well enough to keep things out. ingredient bin i place my flour, beans, rice, and other products in it. i really like it. the quality is good and price is right. i recommended it. great solution to dry storage needs. I use it for rice. I like that the lid can lock open while you get several scoops in a row, rather than having to hold it open. Perfect bins for flour, sugar, rice, etc. We bought three and use them on our wire metal racks. I love that the lids lock open, so they don't keep falling on you while you are trying to scoop out your ingredients. You can label them with vinyl which looks great. We purchased several of these ingredient bins to store many of our dry ingredients for our high school cooking labs. They are awesome because they stack so nicely and the fit perfectly on a bakers shelf or countertop. They are made of good quality plastic with a nice scoop included. These have gone a long way to help us organize our kitchens and now the students have much easier access to all of the ingredients as well. We are so happy with them and have purchased many of them in different sizes for different ingredients. Now I need to buy some for my own home! Excellent ingredient storage bin. I use these bins to hold chocolate chips. The 6.25 gallon bin size will hold a 25lb case of chocolate chips easily. Great value! Love these ingredient bins! The 6.3 gallon easily holds 25 pound bags of ingredients, the measuring cup makes an excellent scoop and the bins reduce our risk of contamination. Good value bins. They don't take up much room and hold a 25 lb sack of most items. The lids are easy to open and secure well. The included scoop is a good size and a nice bonus. I use this to store popcorn kernals before popping. Product comes as described with included scoop. Easy to clean and refill my popcorn when depleted. This bin is amazing. The lid opens so easily to refill and there's a scoop holder on the inside. The best part: the lid opens SO easily and locks into place to stay open while you scoop out what you need. I LOVE this bin. These are the handiest bins for our bakery. They hold large quantities and are durable, from a trusted brand. We fill them with sugars and more! Great , sturdy containers for keeping flour, sugar and other dry ingredients fresh. Big enough to hold what I need, yet small enough to store out of the way. Perfect size for small operation storage. Great scoop holding system, so the scoop doesn't fall inside the product. They stack well ontop of eachother. Good quality for the price. This is a wonderful way to keep bulk dry goods out of the bag and on the shelf. I use mine for panko, and this holds well over a 25# bag. Gave this brand a try because the price was a lot less than other brands. I was a bit nervous, but my fears were for nothing. This ingredient bin works just as well as the more expensive brand, at a much better price! Sturdy plastic containers, we store flour and panko in these. Only draw back is that the plastic scoop that it comes with doesn't have anything to hang on inside of the container, so it sits in with the product. It would be nice if there was a hook for the scoop so the handle didn't sit in the food product. This bin is great for a small kitchen like ours. We use to store flour for making pizza dough and it fits perfecting on the shelf under our mixer. No complaints yet. So glad we bought these for our donut shop! These hold our flour and sugar that are used daily! I would definitely recommend these ingredient bins to anyone! These are just the right size for holding my sugar and flour. My only issues are with the cup and the lid. The cup holder doesn't really hold the cup up like it's supposed to and the lid does have a lock function to hold it open but when this is placed under a table it doesn't quite hold open far enough to be out of the way. Nice aesthetically and holds our dry goods perfectly. Love the scoop and the holder. This makes it easy for us to get product and the lid stays up! Great for storing ingredients. Keeps products safe from kitchen spills. However these are not air tight, and should only be used for products that keep. We really like this product. I wish the opening was just a bit wider but all things considered, it is a great product. It is tall and thin so it doesn't take up much counter space but it extends out from the wall so far that there isn't much room for prep in front of it. It easily holds 25lb bags of flour. The scoop is kinda small but it is probably the max size for such a small opening. Can't say enough about this item. These fit perfectly on my wire shelving, have a great, easy open lid (that stays open while you scoop out your product). The top pops off easily for cleaning and refilling. I am just so pleased with these. A great investment. We have several of these bins they are great for storing all kinds of things from, beans to rice save money on your food cost by using these! I purchased several of these containers for the storage of a variety of flour and sugar products to store on the shelves of stainless steel tables in my commercial training kitchen for students. It makes our kitchen very organized and professional. They are easy to use and wipe clean. These are really nice storage bins with a flip up lid which stays in place when flipped up. It's nice that it comes with a scoop. Good product.